The Lawrence Arts Center offers a 12-month Artist in Residence program to select artists in ceramics and printmaking. We also offer shorter term project based residencies throughout the year for artists of all disciplines. 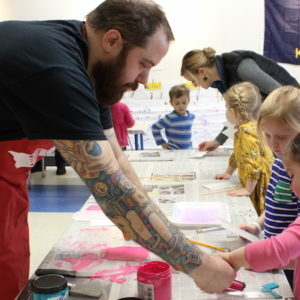 The Visiting and Resident Artists program at the Lawrence Arts Center offers community members a unique opportunity to study visual arts with practitioners of varied backgrounds and diverse skills. New artists are invited each year to become a part of the Lawrence community and share their professional skills with Lawrence Arts Center students and artists. These 12-month Artist in Residence programs are designed to provide a creative and supportive environment in which artists may immerse themselves in creating new work and expanding their own understanding of their medium and other media available at the Arts Center. 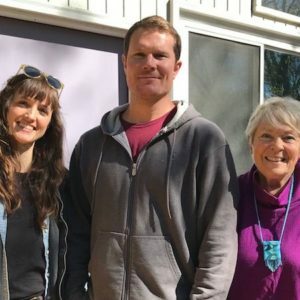 The residencies are a multi-faceted experience including teaching, community outreach, interaction with other artists, and studio care, and culminate in an exhibition of new work. 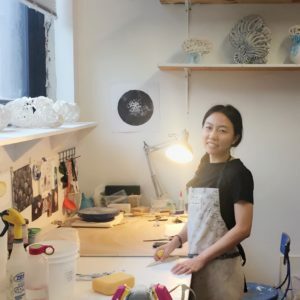 Residencies are currently being offered in Ceramics and Printmaking. More information can be found below. Application deadline is April 15th for 12-month residencies beginning August 1. The residency will begin August 1 and end on July 31. The ideal candidate should have an MFA in ceramics, and be self-directed and able to work independently. Preference is given to candidates who have demonstrated artistic excellence as well as interest in experimentation and innovative techniques. The resident will be provided studio space, $1,000 per month stipend and furnished housing, free dental care, free firings, and 24 hour access to all studios, including ceramics, print, metal, photography, and digital media. Residents will teach a minimum of two classes per session (4 sessions a year) with opportunities to teach more. The Arts Center will facilitate structured and unstructured opportunities to engage with the universities and broader community, and the resident will make at least one presentation each to the school district, university, and public. Residents perform 15 hours per week in studio maintenance. Maintenance of ceramics studio includes: assisting in loading/unloading and firing kilns, mixing glazes and slips, recycling clay, and providing general studio maintenance and upkeep. The resident will assist in annual studio fundraisers and assist in the visiting artist program. Residents will have the opportunity for a solo exhibition of their work in the Lawrence Arts Center gallery. Curatorial and technical support will be provided by the Arts Center. The John Talleur Print Studio is the only community print shop in Kansas. Its facilities support a broad range of printmaking techniques, including intaglio, monoprint, relief, silkscreen, book arts, and letterpress, and offer access to Takach, Vandercook, Hoe (Washington-style), and Griffin presses. The studio emphasizes innovative and solventless techniques, and the intaglio facilities use all low toxic grounds and removers. The residency will begin August 1 and end on July 31. The ideal candidate should have an MFA in printmaking, and be self-directed and able to work independently. Preference is given to candidates who have demonstrated artistic excellence as well as interest in experimentation and innovative techniques. The resident will be provided studio space, $1,000 per month stipend and furnished housing, free dental care, and 24 hour access to the studios, including print, ceramics, metal, photography, and digital media studios. Residents are expected to perform 15 hours per week in studio maintenance, outreach to area schools, hanging print shows, or providing other exhibition assistance. 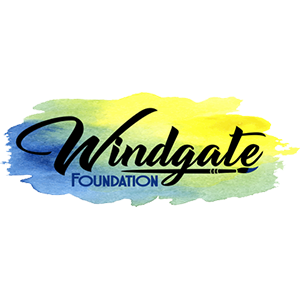 Maintenance of the print studio includes: organization and storage of type, monitoring mordants, and general studio maintenance and upkeep. The goal of the Lawrence Art’s Center’s project-based residency is to help support, sustain, and foster artistic growth by providing material support for the development of special projects. With an emphasis on interdisciplinary and community-oriented work, the project-based residency strives to assist artists working in any discipline and generating works competitive on a national scale. The duration of the project-based residency is flexible, spanning from 2 weeks to 3 months, during which time housing can be provided. Selected artists will receive up to $300.00 toward supplies. Artists will have use of studio space at the Lawrence Arts Center during established times. 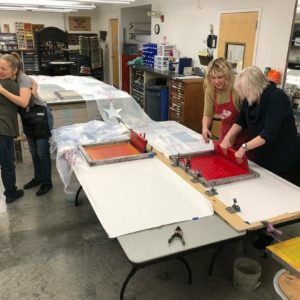 The Lawrence Arts Center is staffed with experts in each of our program fields, as well as arts professionals, and two annual artists-in-residence in printmaking and ceramics who can prove invaluable resources and energetic studio co-inhabitants for short-term residencies. New for 2019! A thematic call for project-based residencies will be announced, and proposals evaluated on how they relate to this theme conceptually, spatially, or through accompanying events and/or activities. Stay tuned for updates, including the announcement of the proposal submission period later this year. Questions? Contact Director of Adult Visual Arts Education Kyla Strid. Applications currently closed. Please check back for applications opening in 2019! Call for Entries: Apply for Our Local Artist Project Based Residency through February 15th.